A dental crown is basically a type of cap/cover that is placed atop your real teeth. 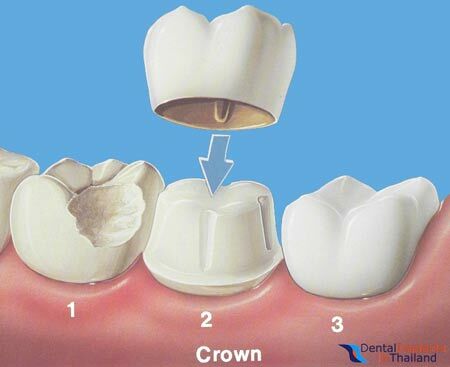 Crowns are made with a wide variety of materials such as porcelain or metal or a combination of both. High quality custom made dental crowns are available today and can be easily be fitted during a short holiday to Thailand. If you are suffering through decayed,damaged or broken teeth or you are just looking to restore your natural smile, having dental crowns with the dental center of Thailand is an inexpensive solution to restore your smile permanently. 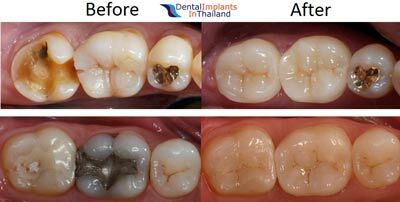 Having your dental treatments in Thailand is highly recommended for people looking to restore their smile or correct any smile/tooth imperfections that occurred naturally over time or un-naturally deteriorated due to damaged or broken fillings. Crowns are also usually needed for some dental bridge repairs as they are affixed to the neighboring teeth to help them become strong enough to support a new dental bridge. The materials and techniques we use in Thailand, allow you an affordable and natural looking dental crowns vs bonding. No more black lines or bulky feel near the gum lines our cosmetic dental specialists are able to deliver the best results on the market for as much as 45% less than the price you would pay back home. That’s enough to pay for your dental treatment,flights and hotels + vacation to Amazing Thailand. Our dental crowns are all 100% hand-crafted in our dental laboratory in Bangkok. The dental labs are able to create very high quality crowns by layering the composite upon itself to give your crowns a slightly translucent appearance much like your natural teeth. This technique is currently only available in Bangkok. To fit the new crowns on your teeth, our approved Thai Crown Dentists will have to drilled down your existing tooth into the shape of a small peg onto which your new dental crowns in Thailand will be fixed to permanently. 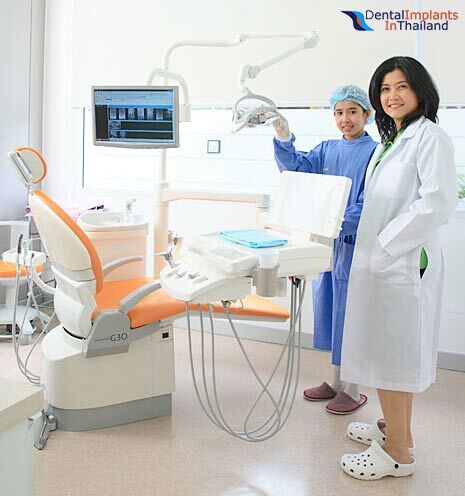 It can take a few days for our dental labs in Phuket and Bangkok to prepare the new crown, so please prepare to stay in Thailand for a minimum of 3-5 nights. Our dentists in Bangkok or Phuket normally require just over two trips total for measurements and placement of dental crowns and bridges. The first visit is for taking impressions/molds of your mouth and to fit a temporary crown while the permanent crown is manufactured. During your second appointment, our dentists will permanently bond the newly created porcelain crowns firmly into place, ensuring a proper fit. Crowns are a virtually pain-free dental treatment and does not require even a local anesthetic. but, if you prefer some type of anesthesia then please just let us know so we can accommodate your request. Are you wondering about dental crowns vs veneers? Porcelain crowns are very sturdy and can last over 5 years or more, but that really depends on the patients oral hygiene, dental care practices. To prevent premature decaying it is important for you to take care of your crowns and teeth by brushing regularly. Flossing between teeth or inter-dental brushes are also highly recommended. Please note the prices for Crowns in Phuket are generally 22%-35% higher than in Bangkok. No-Hassle dental vacation packages available. Our exclusive packages will include your entire dental needs and include a boutique 3 or 4 star hotel near our treatment center with round-trip transportation for you and a guest. We also offer discounted flights to Bangkok and Phuket. To learn more having dental crowns,bridges,fillings at the dental center of Thailand or to check specific dates and options based on your exact needs please contact us today.